Lennar, one of the nation’s largest home builders, is building a new community called Mirada off of Bass Road in Fort Myers. But this is no cookie cutter community. 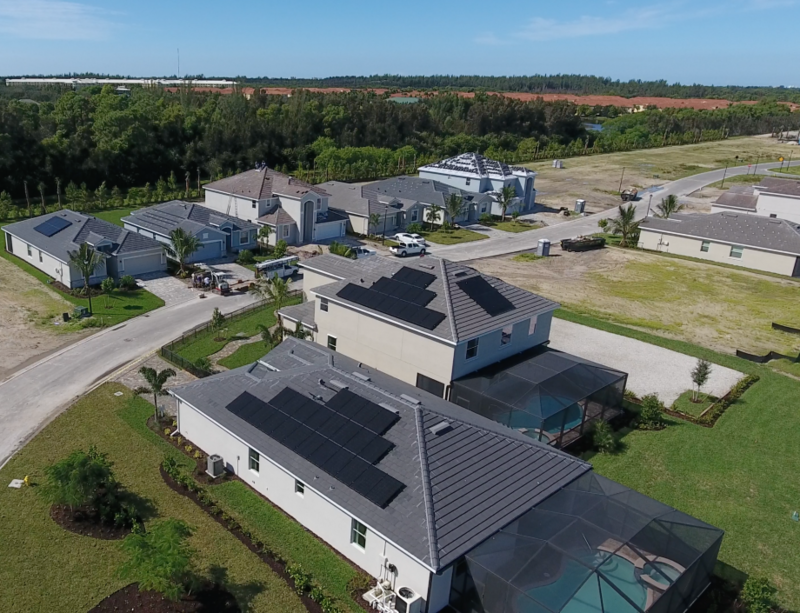 Every home in this Southwest Florida development will have solar panels. This isn’t the first time Lennar has outfit an entire community with solar panels. Through its partnership with Sunstreet, the builder has outfit homes with solar panels in several states including California, Texas, Maryland, Nevada, and Florida. This has set the company apart with state of the art technology and a differentiated product. Florida Solar Design Group is providing a variety of support services to Urban Solar Group (USG), the Florida State Certified Solar Contractor selected to install solar panels in the Mirada community. We are handling administrative, quality control, and technical services to complement USG’s qualified installation crews. USG has a history of managing sizable commercial and residential solar projects that involve multiple installation locations. The company was recently selected as the sole contractor for the SanCap Solar Connect program which brought solar panels to residents and businesses of Sanibel and Captiva at reduced prices. Florida Solar Design Group also worked with USG on this project, providing consultation, sales, and other technical services. Each of the homes in the Mirada community will offset electricity use with a grid-interactive solar energy system featuring Enphase microinverters and Solstice brand solar panels provided by Certainteed, one of the nation’s leading building supply companies. Homeowners will notice drastically reduced utility bills. At times, homes will actually sell excess electricity back to the utility grid through FPL. The Mirada community is Southwest Florida’s first community to equip every home with solar energy. While a few developers have offered solar panels as an option in the last several years, Lennar is setting itself apart as a leader here. This move is expected to improve the marketability and desirability of homes in the community, and add value for new homeowners. While the builder does not currently offer solar pool heating as an option, homes with enough available roof space can be retrofit, and Florida Solar Design Group can provide this service. This solar thermal technology is a popular low cost pool heating option with no ongoing operational cost. Lennar’s Mirada community will surely be a hit with consumers, as many home buyers are demanding energy efficient homes. Solar panels are extremely popular in other states, but regulatory hurdles have slowed adoption in Florida due to limited financing options. Sunstreet’s unique program ensures that home buyers will receive excellent value for their purchase.